An up to date business and commerce publication by Transparency Market Research (TMR) has detected that the global underfill materials market is largely consolidated among a handful of players, and forecasted the competitive landscape to remain limited within the major players despite a few new entrants making a mark. The analyst of the TMR report has notified that as of 2017, Henkel and NAMICS Corporation were the two leading companies, accounting for more than half of the total shares in the global underfill materials, although H.B Fuller, Nordson Corporation, and Epoxy Technology Inc. also held a prominent position. The position of strength of these key players is a reflection of their brand value, which has been built over the years. For instance, Henkel offers packaging level underfill materials that have been designed to deliver reliability while meeting stringent testing requirements and ensuring Pb-free compatibility. The company offers a range of products from materials with incredibly long working lives, low Potassium/Copper (K/Cu) die, high thermal Underfills, and Snapcure processing alternatives. NAMICS Corporation, on the other hand, offers a wide range of flip chip underfills that find applications in graphic devices, LSI, and CPU. Apart from the producers, the value chain of the underfill material market also includes raw material suppliers such as Admatechs Company Limited and semiconductor assemblers and packagers. As per the projections of the TMR report, the demand in the global underfill materials market will be expanding at a considerable CAGR of 8.3% during the forecast period of 2017 to 2024. Revenue-wise, the market is estimated to attain a valuation of 448.3 mn by the end of 2024. Going forward, in addition to developing a brand image and enhancing product portfolio, some of the key strategies anticipated by these players to stay ahead of the curve are: capacity and geographical expansion, new product development, and mergers and acquisitions. On the basis of product type, the report segments the underfill materials market into capillary underfill material (NUF), no-flow underfill material (CUF), and molded underfill material (MUF). In terms of volume, the capillary underfill material segment is estimated be provide for a demand of 512,981 Kg by the end of 2024. Application-wise, the market has been bifurcated into flip chips, ball grid array (BGA), and chip scale packaging (CSP). In terms of revenue, the flip chips segment was worth US$135.1 mn in 2017 and is anticipated to remain most prominent application throughout the forecast period. Geographically, Asia Pacific is the most lucrative region, promising to provide for a demand volume of 612,643 Kg by the end of 2024. Rising demand for mobile electronic products, increasing demand from the military and aerospace end-users, growing popularity of copper pillars, development of low-k underfill by several companies, and entrance of new players with niche technology are some of the key factors driving the demand in the global underfill materials market. In addition to that, the analysts have notified for a few trends such as transition towards cost effective underfills and consolidations by major players by the means of M&A. 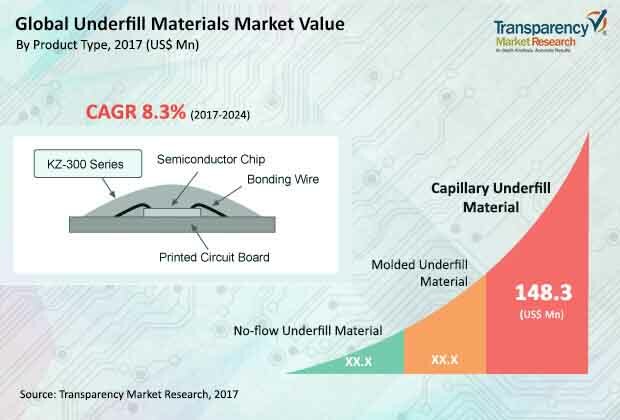 Conversely, downward pricing pressure and high cost of research and development activities for the development of new products are challenging the underfill materials market from achieving greater peaks.